Juniors and seniors at Adair County High School sat through a pair of programs Friday morning aimed to encourage healthy decision-making and illuminate the dangers of distracted driving. “Operation 10-46” and “Ghost Out” – a mock accident and mock memorial, respectively – served as a reminder to students to remain safe and avoid risky behavior Saturday before, during, and after prom. “Operation 10-46” – formerly known as “Safety Zone” – featured a two-car crash with 10 victims, including four fatalities. Eight students and two teachers volunteered to play the injured/deceased subjects. 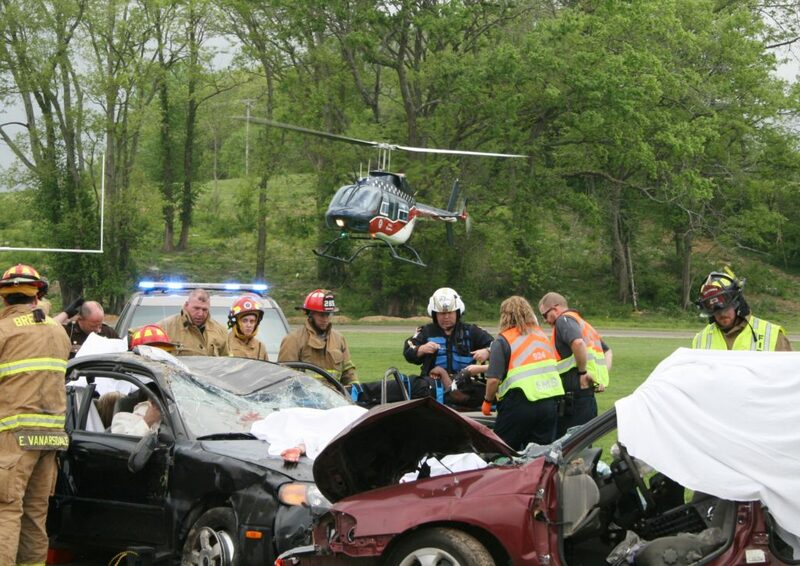 Responders to the accident included Columbia Police, Adair County Sheriff Dept., Adair County Coroner, Adair EMS, Columbia-Adair Fire Dept., Breeding Fire Dept., Air Evac Lifeteam, PHI Air Medical, Grissom-Martin Funeral Home, and Stotts-Phelps-McQueary Funeral Home. Immediately following “Operation 10-46” the students returned to the ACHS gym for “Ghost Out.” The program featured several speakers, a slideshow of Adair County automobile accidents, and – most harrowingly – the reading of 11 obituaries, made up of the 10 students and one teacher who volunteered to participate. Adair County EMS Asst. Manager and Critical Care Paramedic Daryl Flatt shared an account of an accident he and his wife were in a few years ago, one in which both were seriously injured. Heather VanArsdale also spoke, sharing her own near-death experience, which left her in a coma for 45 days. Gaskin and ACHS Principal Troy Young addressed the students as well.